"A bobcat growls over the speaker, and Airmen from the 71st Expeditionary Air Control Squadron spring into action within the darkened confines of the Battlespace Command and Control (C2) Center, better known as 'Pyramid Control.' "
This single audio cue alerts the Weapons Director that an unplanned engagement with hostile forces—referred to as Troops in Contact, or TIC—has occurred somewhere in Afghanistan. On the Weapons Director’s computer monitor a chat room window ashes to distinguish itself from the dozens of rooms he monitors continuously. 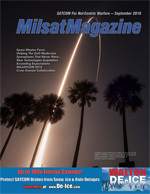 (Talon 21): “Identied on station TBM launch site. PID launcher with missile; personnel activity. Be advised, mosque IVO target.” In the background the tactical radio communications from the UAV pilot is sent over a coalition network to the Trident Systems Mini-SCC device and converted to VoIP. The VoIP trafc is then securely transmitted via the Trident Systems V2- CDS, which lters the media, and forwards to the Weapons Director desktop softphone on SIPRNET. The Weapons Director then relays the information to the local Target Duty Ofcer for the go/no-go decision. The scenario described above and similar scenarios are not isolated events but occur daily in the global war on terror. Large, distributed multi-disciplinary teams work around the clock executing missions and responding to threats and opportunities. 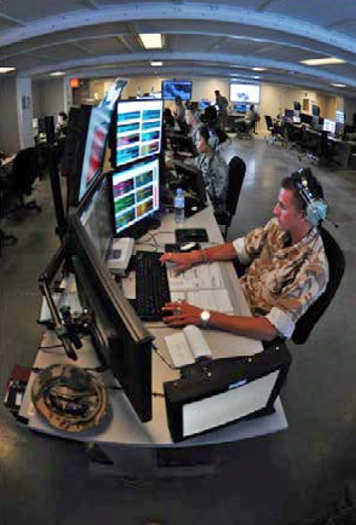 Theatre operations centers (and lower echelons, as well) work best when they are “ghting off the same map” with interoperability among C4ISR systems being the most critical feature in satisfying this requirement. Commands often nd operators supplementing key global command and control systems, such as the Networked Interoperable Real-time Information Service (NIRIS), the Global Command and Control System—Joint (GCCS-J), and the Joint Automated Deep Operations Coordination System (JADOCS), by collaborating with voice calls on command network VoIP phones and tactical radios. Given the rising uncertainty and unpredictability of the nature and scope of future military operations, the use of SATCOM, VoIP, tactical radio and commercial cell calls going forward is likely to increase. The inherent exibility and tailor ability of being able to compose a collaboration environment tuned to mission needs is crucial and adaption to the environment must occur on the fly. Tactical radio and VoIP systems lack the ability to collaborate with users across networks of differing security classication levels (i.e., cross-domain) requiring each participant to have multiple phones at a single station, effectively limiting communication within across enclaves. These requirements have driven the integration of two proven technologies, described below, which can be combined to provide a cross- domain tactical radio capability. 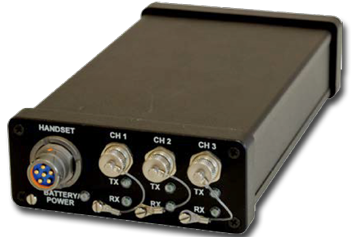 Trident Systems’ Mini-Secure Communications Controller (Mini-SCC) is a man-portable device for cross-connection of disparate communications links, including Tactical Radios and Land Mobile Radios that incorporate High Frequency (HF), Very High Frequency (VHF), Ultra High Frequency (UHF), SATCOM, public safety radios, coalition and partner nation radios, Voice- over-Internet- Protocol (VoIP), and cellular networks. Completely hopset (a list of frequencies the spectrum manager authorizes a particular unit to use ) and encryption key independent, the Mini-SCC achieves communication cross-connect regardless of the radio type, communication medium or security key. For expeditionary and handheld use, the Mini-SCC is contained in a small form factor (1.73” x 4.38” x 7.43”), weighing only 18 ounces without the internal battery, and can be outtted with a rechargeable internal battery for 12 hours of continuous runtime. Setup and conguration are completed through a web-based interface (WBI), allowing an operator with any web browser to access, congure and store settings in the Mini-SCC. If desired, the WBI can even be accessed over Wireless IP or from a cell phone browser. Once set up, the Mini-SCC holds the settings until they are changed; the WBI is not necessary to operate this device. The WBI supports administrator and operator logins and has been tailored to meet IA requirements for security and performance. The Mini-SCC has been tested with a wide variety of US and partner nation radios, include the majority of typically deployed US tactical radios by companies such as General Dynamics, Harris, Raytheon and Thales. Additionally, the Mini-SCC has been used with a variety of coalition radios manufactured and deployed by various partner nations. The Mini-SCC has been employed in a number of exercises for coalition inter-communications with nations such as Korea and Japan; most notably the Ssang Yong Event in Pohang Korea in 2014 and 2016, where it was used to cross- link US Marine Corps and Republic of Korea tactical radios for seamless communications. The balance between protecting and sharing critical information has never been more crucial than in today’s Joint and Coalition military environment. Voice over IP audio and point-to-point video are common tools for operational information-sharing networks throughout the DoD and Intelligence Community (IC). However, the current collaborative infrastructure creates communities of users who frequently are unable to communicate outside of their network or security domains quickly and effectively. Voice and Video Cross Domain Solution (V2-CDS) provides a complementary capability allowing Voice over IP (VoIP) audio and video phone calls across network security boundaries using existing Cisco (and compatible) or Asterisk VoIP call managers and phones, including those connected through Trident’s Mini-SCC (described above) when used together. V2-CDS has been certied at the Secret and Below Information (SABI) level and is on the Unied Cross Domain Services Management Ofce (UCDSMO) Baseline List as the rst and only VoIP CDS (Cross Domain Solution) available for deployment within the DoD & IC. Additionally, V2-CDS has been deployed and accredited for operational use at EUCOM, connecting the EUCOM J6 SIPRNET and the US BICES (Battleeld Info Collection and Exploitation Systems) networks. Phones on EUCOM J6 SIPR and US-BICES can now call each other directly using both voice and video phones, eliminating the cost and footprint of installing and maintaining separate phones and networks to each end user’s desk. Trident Systems’ Voice and Video Cross-Domain Solution delivers VoIP audio and video telecommunications across network security boundaries using existing call managers and videophones in a user-friendly and timely manner. V2-CDS authenticates users and reduces covert channels to an acceptable risk, while simultaneously maintaining point- to-point video capability. Based on government testing, V2-CDS can simultaneously support at least 1000 Audio and 120 Video Conversations across two security domains. 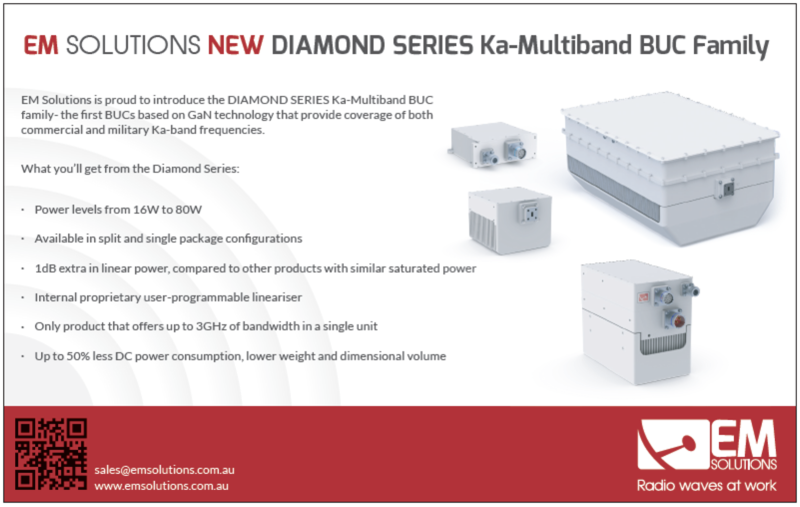 A high capacity/density version with double the number of video calls, as well as a compact version with less video throughput, are also available. V2- CDS works with Trident’s Secure Communications Controller (SCC) product to enable secure cross domain tactical radio and commercial cellular communications. V2-CDS implements requisite NIST 800.53 and CNSS 1253 security controls. V2-CDS is a guard evaluated for operation at Protection Level 4 (PL4) to instantly and securely relay vital video and real-time voice across different security domains, providing face-to-face communication to reduce uncertainty, strengthen trust & expedite collaboration. 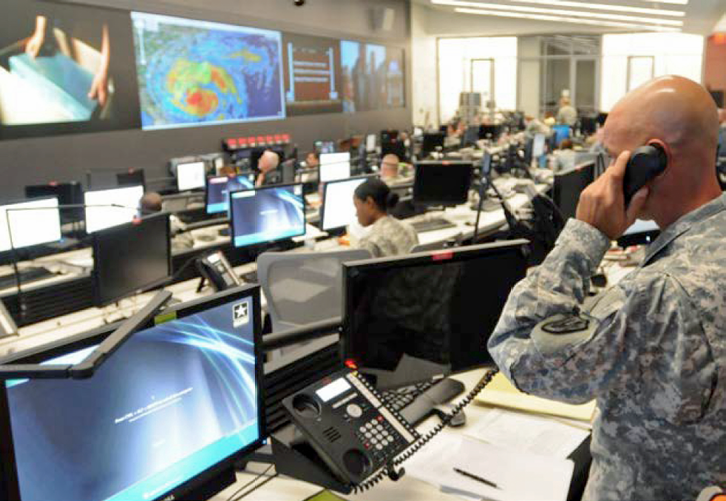 In Joint, Coalition, and rapidly formed ad-hoc disaster response teams, the need to share information quickly is impeded by each organization’s well-protected network boundaries. In cases where special coalition networks are created (e.g., AMN), users often nd themselves with multiple computer terminals and VoIP phones, one for each network and still unable to combine users from multiple networks in one chat room. The solution to stove-piped security enclaves is a set of emerging cross-domain capabilities supporting tactical radio cross-connect and a VoIP solution tailored to ops center requirements. Trident Systems is a veteran-owned small business that delivers innovative and affordable technology solutions for critical government and commercial needs. Founded in 1985, Trident continues to harness technology and provide leading- edge solutions to every Military Service, the Intelligence Community, and a broad spectrum of government and industry partners. Trident develops products in three primary focus areas: Integrated C4I systems, Radar Systems, and Assured Collaboration Systems. Trident also provides an array of services from Complex Systems Engineering services for complex system development as well as Collaboration Services, providing a full range of design / build services for state-of-the-art facilities including supporting of the Integrated Air Defense System in the National Capital Region. Trident’s headquarters is located in Fairfax, Virginia.